When I first saw this Sealed with Dog Kisses Pet Rubber Stamp I immediately loved it! It is also available as a self-inking stamp. Currently, Cooper is nearby happily snoozing with periodic dog dreams of pointing at doves and quail. It was just last Saturday, we were looking at Vintage Garfield Envelope sets and today it is fun seeing this unique way of sealing our letters! At the SmooshfaceUnited Etsy Shop, they have this offering. Options abound with how to order the Sealed with Dog Kisses Pet Rubber Stamp. Wax seal dog stamp! 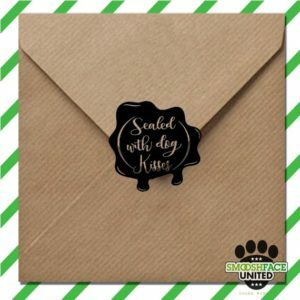 Send those letters off in style – ‘sealed with dog kisses’. “Size: rubber stamp: 1.5″sq / self inking 1-5/8″sq.” They do have the option of figuring out a different size and get the size you exactly want if wanting something different.